I think it will come to pieces. William should be thankful his father paved the way and yet he isn't. Harry could use this to spend his time with people from all over, but prefers to do other things. He has his charities, but they aren't as British oriented as they should be. Just spoiled and not half as trained as Charles was at their age. Neither wants to adhere to tradition or follow any protocols. If that is the case then both of them are disgusting. What a pair of trifling spoilt brats who have the world at their disposal and don't give back. Little Willy Woo Woo in particular. Hopefully Harry will come about. Maybe Harry is planning on taking over the Princes Trust and they are just waiting until Willy on vacay to announce it. Considering all that Harry has established for himself with Invictus and the like, I'm not going to give him any flack for not taking over the Prince's Trust. As far as I'm concerned, he has nothing to prove and owes no one, when it comes to being charitable. I would think that it would be expected of William, considering he's set to be the next PoW AND the little snot hasn't created anything impactful on his own. I think Harry and his future wife will take it over and break away from the golden couple. Am I really bad to hope that Harry comes home with a European princess? I know the chances of that happening are very slim, but of it happens, the Middletons will be mad as hell..which will provide great entertainment for us. I remember some discussion when they set up their own discussion that they intended for all their charity work to come under that umbrella and that neither of them wanted to take on an existing organisation but to have their own. It was clear to me that neither of them are close to Charles anymore - other than having him pay their bills for them of course - but I don't see either of them taking on The Princes Trust. They have no connection to it or to him and he looked clearly away when asked the question and looked so sad which says to me that they have both refused to have anything to do with it. They are tied at the hip with their own foundation in their names and that will be their focus - at least until William is King and then it may been to be renamed again - as the Foundation of King William, Queen Catherine, Prince Henry and .... (assuming Harry has found a wife by then). ^At the rate things are going I very much doubt there will be a monarchy by then. Plus the people of today are well aware of what goes on, questions asked etc. Doubt it will last past bill medd anyway, if he ever gets there. It is sad, but not unusual in families torn apart by infidelity and divorce. Charles chose his personal happiness over his duty and responsibilities when William and Harry were boys and that has consequences. Charles is reaping what he sowed, and such is life. ^^I highly doubt there will be a monarchy for William to destroy ... Charles is his own worst enemy, his 'I'm above of PM & all of Parliament' point of view + his *nasty* friends & others things... he's the great gift of Windsors to the Republicans. ^^I would have to agree with you. I would be very surprised if the monarchy doesn't end with Charles. The public attitude toward the institution is not what it was 30+ years ago. Wimpo bill seems to think he is the only one ever to come from a broken home. His attitude stinks, the world owes him nothing, he has the best of everything, free via the taxpayer, and yet he wants more. He should be called jprince gimme, gimme, gimme. Sad to say but I do not think he would have been much different if Princess Diana was still with us. That is his rotten surly nature we see now, the real wimpo bill. Unsure as to whether PD could have controlled him once he went off to university. Other kids lose their mothers at a similar age and have to cope with it, and turn out lovely people. He had everything, and still he turned out to be a detestable person in every way. One would think it a compliment to be asked to take over the Princes Trust, in fact it is what we would all have expected no doubt. Harry will be much better if he gets to run it, anything wimpo bill touches seems to fall apart, best he leaves it alone. The Curse of Doom follows the lamebridges, every time. I think the Princes Trust has had a lucky escape not having wimpo bill at the helm, a very lucky escape. If Wimpo was going to take it over, the muscling in Medds would have been poking their snouts in too; desperate to give the illusion of being 'somebodies' and far to thick skinned to see that the whole world is laughing at them all. Let's keep on the main topic! 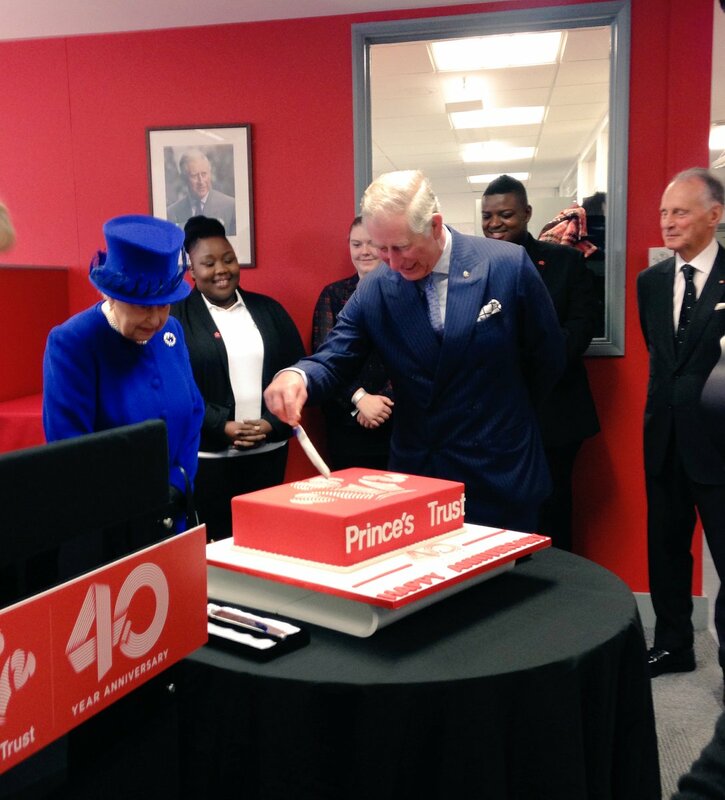 The Queen and The Prince of Wales cut the celebratory cake to mark 40 years of amazing @PrincesTrust work! She is young-looking for her age. Tes, looks very well for almost 900 - looks a tough old bird too, no meek and mild doddery old lady there, an inner core of steel runs through her.